I love making soup because you get to throw everything in a pot and let the stove do the rest of the work. This soup tastes great and has some healthy ingredients too. 1. Heat olive oil in a large stock pot over medium heat. 2. Add the onions and carrots. Saute until onions are tender, about 5 mins. 3. Add ginger, garlic, curry, salt and pepper. Stir and cook for 2 mins. 4. Pour in chicken broth, sweet potatoes, diced tomatoes (with juice), and lentils. Turn heat to medium-high and bring to a boil for 1 minute. 5. Reduce heat to medium-low and simmer for about 40 minutes or until sweet potatoes are tender. This makes about 8-10 servings. 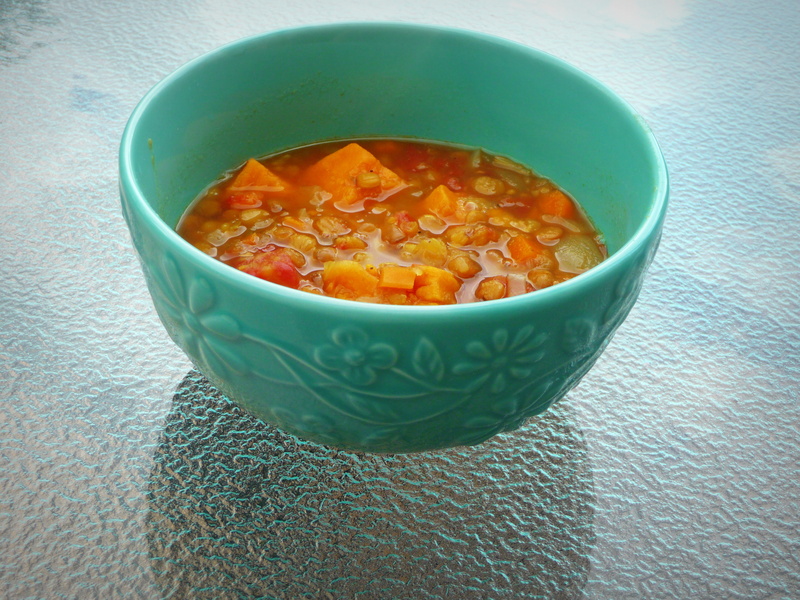 Posted on May 11, 2012, in Main Dishes and tagged healthy, lentils, recipe, soup, sweet potatoes. Bookmark the permalink. Leave a comment.